Well now. Here I am on my first visit to Australia, primarily in order to speak this week at LinuxConf Australia 2011 (a session on Lightweight Messaging for smarter devices on Friday, for those interested). Given the serious disruption to Brisbane over the past two weeks, the organisers have done a superb job of re-jigging the entire event: changing venues, sorting out accommodation, reorganising the transport plans, catering, etc etc. Stunning. Although we may not be in the location that was originally intended, I’m really impressed by the way things have come together, so a huge thanks to the whole team. there is simply too much to do / see / hear! I spent all of day one at the Arduino miniconf, which was great… although I’ve played around with Arduinos before, I’d never built one from scratch. It worked! 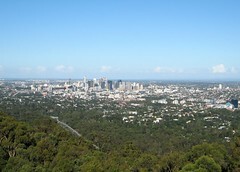 Brisbane is a lovely city. The weather has been just about OK for me so far, although when I left the UK on Friday it was 0C and now it’s in the high 20s! The flood water has receded and the clearup is ongoing but the city is getting on with things. there has been great wifi coverage… by far the best I’ve ever encountered at a conference. Spread between the conference venues, the accommodation (several km away), and enough for many geeks with multiple wireless devices! Why can’t every conference manage this? are a lot of photos hitting Flickr…. the only thing that frustrates me is that most are not open for tagging / people tagging. Please open your pictures, particularly those from events, for tagging. I’m also hoping that more people will start to use Lanyrd for aggregating write-ups, slides, photos etc. Follow more from the conference via Twitter, check out my photos… a live stream of some of the sessions should arrive soon. 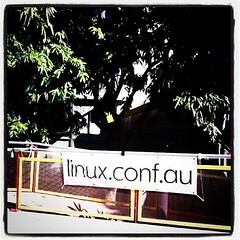 This entry was posted in blog and tagged #lca2011, Arduino, Australia, brisbane, conference, Linux, linuxconf, open, open source. Bookmark the permalink.